Officials watch Chase Patrick perform at the Georgia Top 100 Underclassmen Showcase in 2015. Jeff Segars hoped his idea would save high school baseball players a lot of time, money and hassle. One summer while the Loganville coach was in Las Vegas working the Top Gun Baseball Showcase, he witnessed athletes paying $400 to $500 plus travel expenses to attend the showcase event. Not that Segars has an issue with upper-scale showcases, he just wants to make sure every player has an oppertunity. "I thought to myself, we need something like this in Georgia that gives kids an opportunity to get noticed and is affordable," Segars said. "Thats why it is priced the way it is." 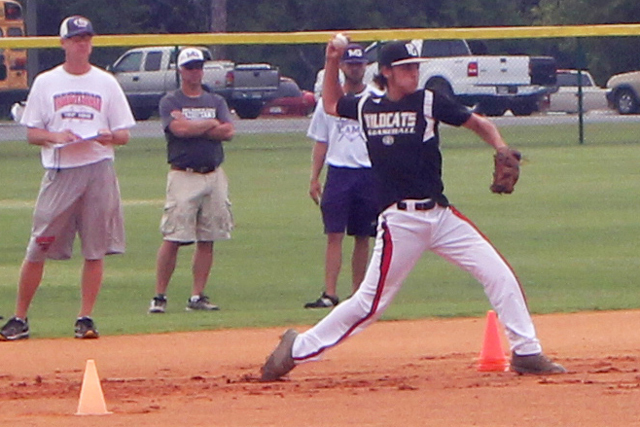 Segars pitched his idea to several members of the Georgia Dugout Club and the Top 80 Showcase was born in the summer of 2003. He convinced several college coaches as well as pro scouts to help him and his team evaluate players at several locations throughout the state. The top 80 performing players would be selected to showcase their skills at a central location in front of hundreds of college coaches and scouts. Segars felt that having pro and college scouts grade the players increased the validity of the event as well as kept high school coaches who often worked the event from showing favoritism and selecting their players. The event started with roughly 250 players at various sites. In 14 years, it has grown to become one of the premiere showcase events in Georgia. More than 500 players participate and the top peformers are selected to perform in the Top 100 showcase held each June. "Our No 1 goal is to get kids out there and get them looked at," Segars said. "We want to promote players as well as Georgia baseball." For $75, players register for a showcase within the closest proximity to their school.Before the evaluation, they are given a T-shirt. Players are evaluated in the 20, 40 and 60-yard dash, arm strength, accuracy, batting practice mechanics and there is a defensive evaluation. Pitchers get graded on their pitches, including fastballs, change-ups and curveballs. It doesn't end there. Participants are given a CD that includes all of the nation's colleges as well as graduation and SAT requirements to play at the collegiate level as well as instructions on the recruiting process. Evaluations are held in the morning, then in the afternoon session, players are divided into teams and games are played, giving evaluators a chance to see the participants in a game-type atmosphere. If scouts miss the showcases, the player's profile and his performance are loaded onto the Georgia Dougout Club website. Longtime Parkview coach Hugh Buchanan, now a scout for the Atlanta Braves, values the Top 100 Showcase. It gives him a chance to look at young prospects all at one site. "You look at the number of showcases out there and it ranges from high schools to colleges to indivuals running them," Buchanan said. "From a standpoint of being seen to the cost, I think the Top 100 is the best deal going." Segars realizes high school players are still going to attend more costlier showcases out of state. However, he said the Top 100 gives players a chance to stay close to home and get noticed. He cited two first round draft picks -- Lee County's Buster Posey and Griffin's Tim Beckham -- as former showcase alumni. Both were taken in the first round of the 2008 Major League Baseball Draft. Beckham was taken No 1. overall. Former University of Georgia standout Kris Edge has seen the impact the Top 100 Showcase is having. As a former college assistant, he relied heavily on the Top 100 while recruiting. Edge said he usually signed seven or eight players to scholarships from the event. While most junior colleges as well as small colleges don't have large athletic budgets for recruiting, the Top 100 gives them a chance to see some of the state's best baseball players within a reasonable driving distance. "Colleges play during the spring just like the high schools and what people don't understand is that college coaches can't be everywhere," Edge said. "You really have to rely on summer and travel baseball to look at players. This event allows us to go to one location and see all these good players."